India is a vast country and when I say vast I mean really vast. Each state, each region even each village has special cuisine. Even if one wanted, it is next to impossible to sample all the food in India, not that I’ll give up though. So, today I wanted to bring to you a blog I have been admiring for quite some time. 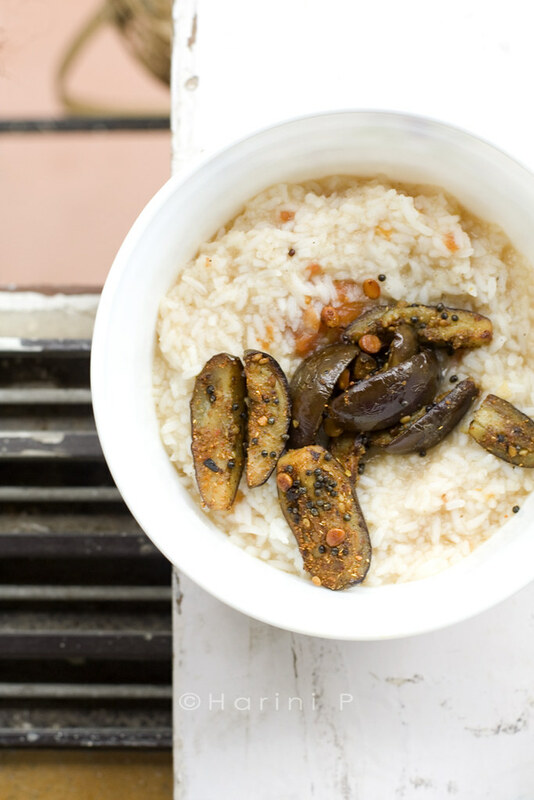 Harini, the author of Tongue Ticklers is one of the few vegan bloggers in India and specializes in South Indian food, which is often naturally vegan and even gluten free. I always suggest friends with eating restrictions to embrace South Indian food which is not only delicious but often healthier as well. I met Kulsum through a guest post I did for Xiaolu. Since then we have been in touch through predictable mediums like Flickr and Facebook. I have admired her eye for composition and framing and love her photographs. When she asked me whether I would do a post, it came as a pleasant surprise. Her request was that my post should be a naturally vegan dish. 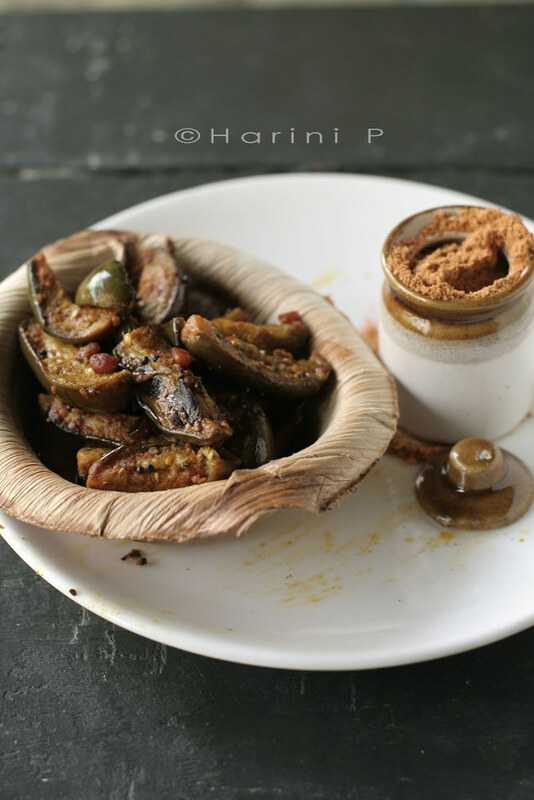 I hope this simple roasted curry from Palakkad, which made me change my opinion about eggplants wins you over. Traditionally we use small, purple eggplants about two inches long and not very thick. This variety cooks fast, is not pulpy and hence suited for stir fries/roasting. The dish owes its delicious taste to the curry podi or spice mix. Roast each ingredient listed under ‘spice mix’ separately. The dals should turn pink. When the coriander is roasted half way through, add fenugreek seeds and asafoetida. Continue roasting till the coriander becomes aromatic. Cool and grind all the roasted ingredients together to almost fine powder in a spice grinder. I say ‘almost fine’ because I prefer it a little grainy. Set aside till needed. Wash and dry eggplants. Quarter each eggplant lengthwise. If thick then divide into five segments lengthwise. Set aside. Heat oil till moderately hot in a wok. Add mustard seeds. When they splutter, add Bengal gram dal, sesame seeds (if adding), asafoetida powder and roast till the gram turns pink. Stand back as sesame seeds tend to splutter and jump around quite a bit. Now add the chilli powder, turmeric powder and the eggplants. Toss them so the seasonings are coated well. Add half the salt and toss once more. Cover and cook for about five minutes. Stir occasionally to see that the eggplants are toasted and turn brown, taking care not to burn. Do not cover too long as the steam might turn the eggplants mushy. We do not want them mushy but perfectly cooked and to retain their shape. When cooked add the spice mix and toss till they coat the eggplants evenly. Adjust salt if needed. At this stage, you can add a tsp. of oil if the stir fry appears too dry. A little oil makes a lot of difference but I resist myself here! Serve with rice and dal/rasam/sambar. This tastes good with phulkas also. If in a hurry, replace spice mix with off the shelf sambar powder or bisi bela bath powder. But, I recommend making it fresh. I can't eat spicy food but I always enjoy learning more about eggplant dish. Your photos are beautiful! Your photos are so beautiful! I love them! Ahahaha I just saw what is written above this comment box. You are a wonderful wife Kulsum:) I hope you are enjoying your time in Pune now. This is such a lovely post and you know I am partial to South Indian cuisine:), Beautiful! The little eggplant over the rice looks delicious. I'm not sure I can get all the spices, or eggplant that small, around here, but I'm going to try to make this in some form. Your photos are beautiful. Kulsum, thank you for featuring me on your blog. Thank you, dear readers of 'Journey Kitchen' for all the kind words of praise that you have showered on my photographs and post. Sue,I just saw the eggplant varieties you have posted on your blog. The first one should be well suited for this dish. Do try it. It's nice to see Harini here! I've been admiring her lovely photos and recipes on Flickr for some time now. I love how we all cross paths at some point! Yum yum! This looks delicious! Eggplant is my favorite vegetable, so I always love seeing new ways to make it. Your photos are just gorgeous! And this recipe looks divine. She is amazing! Wow, I have never seen eggplant look so beautiful and enticing! I want a whole plate full right now! That does look quite delicious. The photos too, are beautiful. I love learning and hearing about all of the varieties of Indian food. Ooh my father-in-law has a total surplus of mini eggplants. I'll definitely try this because we don't know what to do with all those little purple cuties. I just love your presentation of this dish. So rustic and beautiful. This is making me drool. I am not sure if I had this before but a friend of mine once made me something similar and I totally loved it. 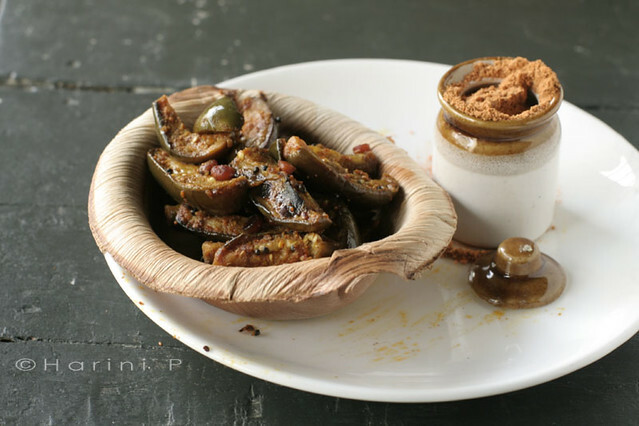 I love anything eggplant..the spice mix sounds so so flavorful! Beautiful pictures Harini & a lovely guest post. These eggplants looks so good- not soggy at all which is what happens whenever I cook them! Will definitely try this out and let you know how it tastes! That looks fantastic! Eggplants and spices, mmmhhh. A dish for me. It looks absolutely delicious Harini. Not sure if we can find that small variety of eggplant here but will definitely have a look. How wonderful - Two good things and two photographers with great eye for detail in one post! Beautiful combination of 2 of my favorite bloggers =D. What a delightfully flavorful dish!